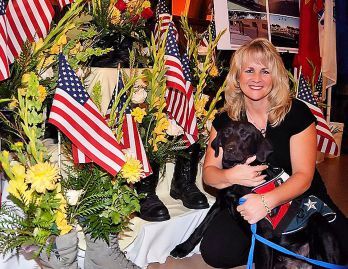 Shannon Walker founded Northwest Battle Buddies to train service dogs for veterans. She often receives rescue dogs from local shelters. 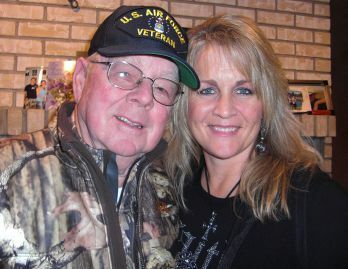 Shannon learned to admire veterans from her father, who served in the Air Force. He loved her idea of starting NWBB. It costs $10,000 to train each service dog. Shannon raises funds for NWBB through events such as an annual auction dinner. The first veteran to seek Shannon's help, Kevin Williams asked if she could train Sam, his pet Labrador, to be a service dog. 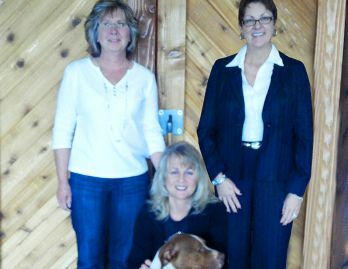 Lisa Walters, mayor of Battle Ground, and Heidi Hahn (right) serve on the board of NWBB. They also both wear Brighton accessories. Shannon Walker is having a busy day. A master trainer and kennel owner, she has 18 dogs to bathe. She doesn’t have time to help Kevin Williams when he arrives to buy dog food. Yet when she hears from a staffer that he’s a veteran, who would like his dog trained as a service animal, she invites him into her back office to talk. Shannon never allows people into that work area, but her dad taught her to have special respect for veterans. Her father, Glenn, served in the Air Force and exudes the integrity and patriotism of true heroes. The middle child between two brothers, Shannon enjoys an extraordinarily close relationship with him. “Dad would say that boys were wonderful, but girls are special,” she says. "Everyone says I'm just like him. My greatest desire my whole life was to make my dad proud of me." When Kevin comes into her office, Shannon sees a classic military man: big smile, rosy cheeks, clean cut, respectful, confident. But underneath that physical well-being, Kevin struggles with Post-traumatic Stress Disorder, a silent disability that can lead to social agoraphobia, alcoholism, drug abuse and suicide. He needs to go to New York for therapy, but doesn't want to do it without his dog. When he brings his pet Labrador, Sam, back that same day, Shannon sees immediately that the dog is a nervous, anxious animal that can be relaxed through obedience. Shannon’s expertise stems from 20 years of experience. At 25 years old, she gets her first German Shepherd, a dog with terrible manners. Her husband says to train the dog or get rid of it. Luckily, she connects with Gene England, who specializes in Schutzhund, the training used for police dogs that produces the highest form of obedience. When people see her in the park with her well-behaved dog, they ask her how she does it. Off-hand advice turns into a full-fledged business when she starts Man's Best Friend, a training and kennel facility, and moves it to Battle Ground, Washington, in 1997. Shannon also competes in Schutzhund events for 10 years. In the process, she grows into a strong, trustworthy leader. In 2003, she plans to compete in the IPO championship in Diest, Belgium, with a team of five American men. After all the other trainers back out of the trip the day before, she decides to go anyway. Not only is she the only American to compete, she ends up winning that prestigious event. When she gets home, however, she faces an angry husband, whom she feels never supported her dog training pursuits. Instead of celebrating her success, he seems resentful of it. A bitter argument ensues, requiring the police to be called. She leaves her husband that night. Yet as devout Christians, they try to reconcile through counseling. She stops competing, but that sacrifice doesn’t improve the relationship. Shannon ultimately comes to the realization that her marriage can’t be redeemed. In 2007, she starts over as a single mom with her then-twelve-year-old twin boys, Jarod and Jacob. Shannon trains veterans and dogs together in crowded, noisy malls and other public places. After two months with Shannon, Kevin’s dog Sam is ready for the next phase of training. For the next two months, Shannon works with Kevin and Sam together, bringing them through noisy, crowded malls to desensitize Sam to sensory overload. She learns to ride escalators, to be a watchful, calming presence and to create a barrier between Kevin and other people. Shannon sees what a life-changing difference Sam makes in Kevin's life. The training usually costs $10,000, but she gifts it to him. Although 400,000 returning veterans suffer from PTSD, and a growing number of them would like to have service dogs, the process of acquiring one can be long, difficult and expensive. 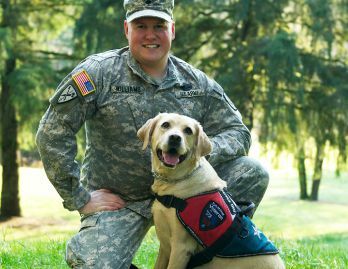 The U.S. Veterans Administration suspended its support of service dogs for veterans with PTSD in 2012. It also suspended its study on the effectiveness of such therapy. Shannon strongly desires to start a charity that would provide these dogs to veterans, but she has no idea how to go about creating a 501(c)3 organization. Her dad loves the idea and encourages her to pursue it. As she struggles to understand the paperwork to start Northwest Battle Buddies last November, he says, "Just think about a Veteran's Day with 15 of your dogs walking proudly." At the time, it seems like a far-off dream to her. Glenn always taught Shannon's sons to stand up for what they believe in and to fight for those who cannot fight for themselves. Both boys are in ROTC and plan to follow their grandfather’s footsteps into the military. At Glenn’s memorial, Shannon weeps as she sees her boys speak, standing tall in their dress blues. “Grandpa used to say, the reason we needed a savior was because there were no perfect men,” Jacob says, through his tears. “But I think my grandpa was as close to perfect as can be." “One of the things that makes me most sad is that I don't get to share how much of a difference it's making,” Shannon says, of her nonprofit. “I don’t get to share the pictures.” Yet she takes solace in knowing that her dad would be so proud of how well it’s developing. Her dedicated eight-member board of directors includes Lisa Walters, mayor of Battle Ground. Lisa brought her dog to Shannon for training 10 years ago and has been involved with NWBB from day one. Heidi Hahn has been a client for seven years and was a tenacious volunteer at early NWBB fundraisers. Both women also share a fondness for Brighton accessories, while Shannon and her family shop for Brighton belts at Wayne’s Boot Shop in Cody, Wyoming. They’re planning their next fundraising event for February 21-23, 2013. It will include a dinner, auction and a book-signing with Luis Carlos Montalvan, author of Until Tuesday. Meanwhile, on November 10, Shannon fulfills the dream her dad described that day when Northwest Battle Buddies was just a heart’s desire. 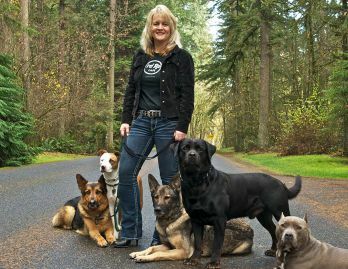 She is bringing 15 of her certified or in-training service dogs to the Veteran’s Day parade in Vancouver, Washington. Amid the flags and military units, she walks for her father. She walks for her sons. She walks for every veteran who needs to heal.